As a kid it was always Hothfield Common but it's got a smart new name now and is very well managed by the KWT. I'd been over a few times during the winter to do some landscape photography and was drawn there again by reports of over 1,000 Southern Marsh Orchids on the reserve. I arrived just before 6am and located them shortly afterwards, but there was a problem. 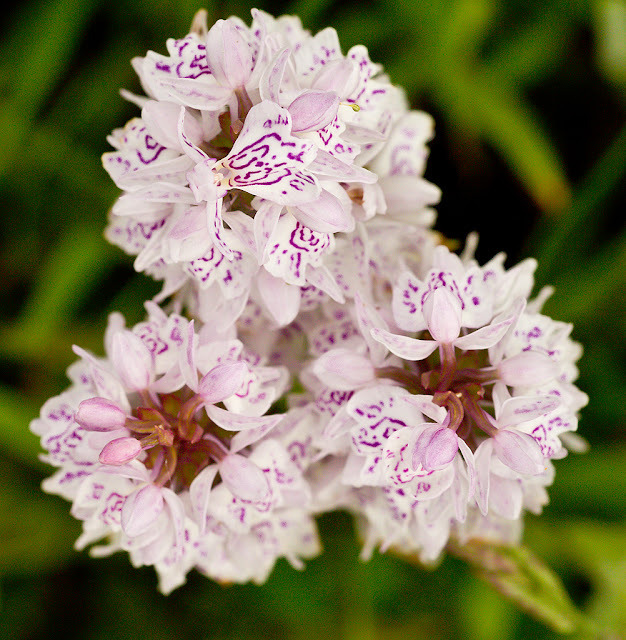 The orchids were growing in a marshy area that was a few inches deep in water with even more inches of mud. Furthermore, the resident highland cattle appeared to frequent this area so there was the cow dung to contend with too. I had my walking boots on but it was going to be a 'wellie' job for sure. I made my way across to the main bog and as I approached, I could see it was covered in Bog Cotton. On getting closer I could make out what I thought were Common Spotted Orchids but on closer inspection, turned out to be Heath Spotted. This was a real bonus as there were thousands of them with many being easily accessible. I spent about an hour photographing them before the wind got so strong as to make things impossible. 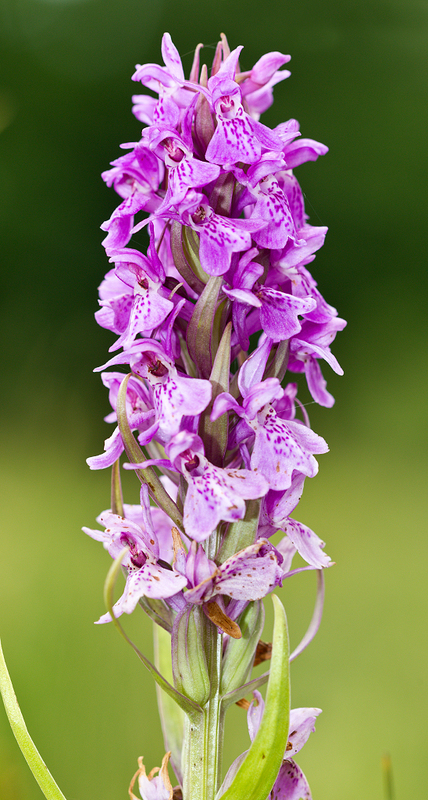 I returned that evening with the appropriate footwear to photograph the Southern Marsh Orchids. I could not lie or sit down so had to squat precariously, ankle-deep in slurry. Focusing was very difficult, even with live view, to the extent that I only managed a few record shots. 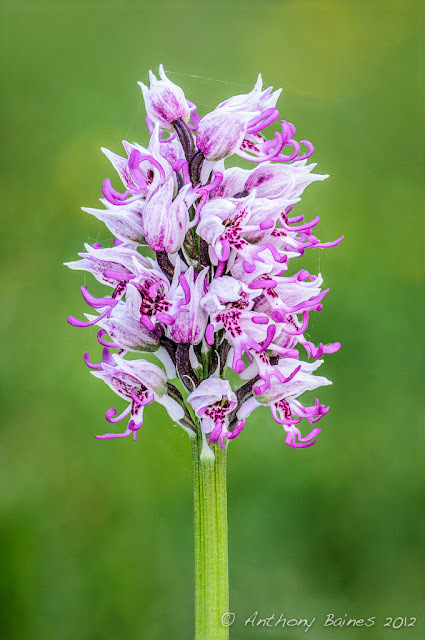 Although rarer than the Heath Spotted, they are not as photogenic, exacerbated by the fact that most of them had 'gone over', with brown tinges appearing on the lower petals. 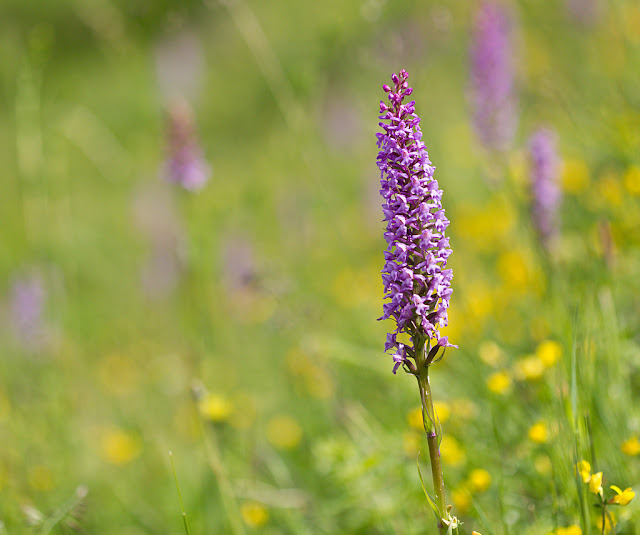 We were blessed with a beautiful day yesterday and I got up early to make my way over towards some local orchid sites. First on my list was late spider (having missed early spider earlier in the year as I was away when they flowered). I spent about an hour photographing a single specimen. This is the best of the bunch. Later in the morning the wind got up, making macro work very difficult. Here's a common fragrant with a supporting cast of buttercups and others. There were a few pyramidal in a sheltered position and I grabbed a few shots of these too. With Anthony recently being successful at Associate level with the Royal Photographic Society (RPS) there was a certain peer pressure for me and Philip to tread those same steps. We decided to submit a panel for the Licentiate distinction first, despite the fact that one can go straight for ARPS if so inclined (brave and foolhardy some might say). The most common method of attaining an LRPS is to submit a panel of 10 prints. It is possible to provide a set of digital images for projection but the pass rate is known to be lower and, as Philip and I are happy working in print media, it was a 'no-brainer'. I started thinking about my panel seriously early this year and quickly settled on a theme with a three-row layout: a top row of nature, a mixed middle row and a bottom row of monochrome landscape. 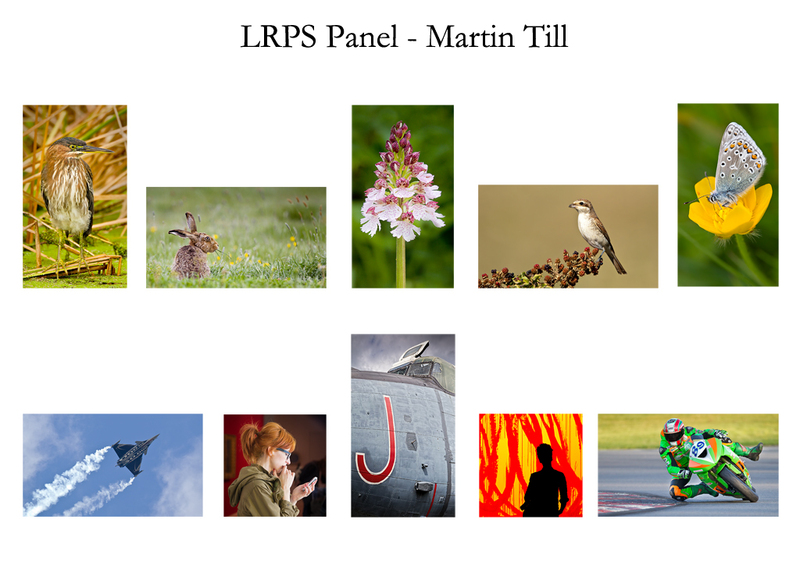 Philip and I each put a draft panel together, along with a few spares, and took it along to an RPS Advisory Day - luckily there was one nearby in Canterbury in mid-April. The day was led by Richard Walton FRPS and he gave each of us sound advice on our panels - in my case totally restructuring it by removing all the landscapes, changing from three rows to two and making the top row nature with a mixed lower row. It appeared to hang together well and I stayed with Richard's suggestions and re-printed and re-mounted accordingly. Note: If you thinking of submitting a panel for assessment, attending an advisory day in advance is a MUST. You get to see examples of successful panels and get expert advice on your work from an RPS Fellow. Our chosen assessment day was last Thursday, 14th June, and we headed off to Bath the day before so that we could hand our precious cargo in the day before and spend some time taking some photographs around the City. I have some friends who live just outside Bath and they were kind enough to put us up for the night in exchange for a meal at At The Chapel in Bruton. Sue kindly offered to drive and we had a fantastic evening. A combination of a fatigue from traipsing around Bath and a few local ciders meant that we both slept really well the night before. We headed off to Bath, parked up near to RPS HQ and found a delightful Italian deli for breakfast. On entering Fenton House we mingled with other equally anxious souls in the foyer before being invited upstairs to the assessment room. We were sitting right at the back (~20m) from the prints so could not see them in great detail, awaiting eagerly for the panels to be hung. The chairman of the assessment panel introduced himself, gave an overview of proceedings, after which the other five assessors introduced themselves. There were two digital entries which would be screened first, followed by the prints (about 30 I believe). The individual images are scrutinised and the overall panel is considered, after which the assessors form a huddle and fill in their score cards. Everyone holds their breath awaiting the outcome. One of the assessors talks about the panel highlighting its positive and negative merits before issuing their judgement, which takes the form of 'we are unable to recommend this panel' or 'is <author's name> in the audience'. The next print panel came up and that failed - as did the next three. That made it zero acceptances out of the first six - ouch! You can imagine how we were feeling. Finally though, a successful panel. A huge sense of elation from the photographer and a slight drop of tension in the room. The next panel then failed! After that the pass rate was higher and, by the time we left at lunchtime the balance was around 50:50. My panel came up around noon and I waited in anticipation for a couple of minutes (that felt like a couple of hours) before the assessor praised my panel and finished with those words 'is Martin in the audience' - deep joy and much shaking of hands. We knew that there would be a break for lunch at 1pm and I could sense that Philip was getting more and more tense as time went on. It suddenly dawned on me that if Philip were to not make the grade we would have a thoroughly miserable journey back to Kent - he in despair and me racked with guilt. At 12:50 Philips panel was displayed. I have to say, from the back of the room, it looked good. I was confident and I smiled at Philip who could not reciprocate. So many panels were failing on technical issues: not sharp, over-sharpened, colour casts, lack of highlight detail and poor print quality being the main reasons. 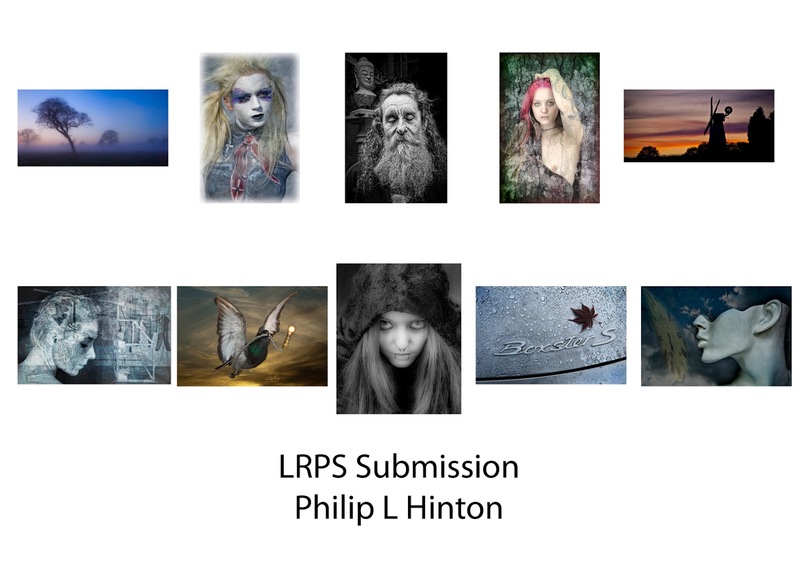 The assessor who spoke on Philip's panel enthused over it commenting along the lines of 'here is someone who's photography is in the same style as mine but who does it better'. A well deserved pass! When we went to collect our panel we were asked by the RPS if they could hold on to our panel and use them as examples for use in forthcoming advisory days. We were flattered and left even more contented with our print boxes empty. There had been one more panel before lunch (a quick celebratory drink and a panini) after which we decided we would depart gracefully and try and beat the traffic. Philip for sharing the journey, including that last-minute sizing, printing and mounting. Fig. 1. Belgian Air Force F16 displaying at Duxford, May 2012. (Left) Straight from the camera. (Right) Blue sky intensified as described in the text. I'm sure this idea has occurred to many other people, but I've not seen it in any online tutorial specifically, so I thought I would post it. When I'm photographing aircraft against blue skies, I like the blue to be really intense blue, a bit like the sky in high mountains (or, more prosaically, the effect given by a polarising filter). British skies are usually some pallid shade of blue (Fig. 1, left) rather than the intense blue I like (Fig. 1, right). So, for the last couple of years, I've been using a very simple way in Camera Raw and now Lightroom to intensify them. There are lots of other ways to do this, but this has the virtue of being simple and quick. The blue of the sky sits conveniently within the colour range covered by the Blue slider in the HSL panel. The sky can be darkened simply by sliding the Luminance Blue slider to the left. Sometimes skies can have a bit of Aqua in as well, so that slider might have come down as well. 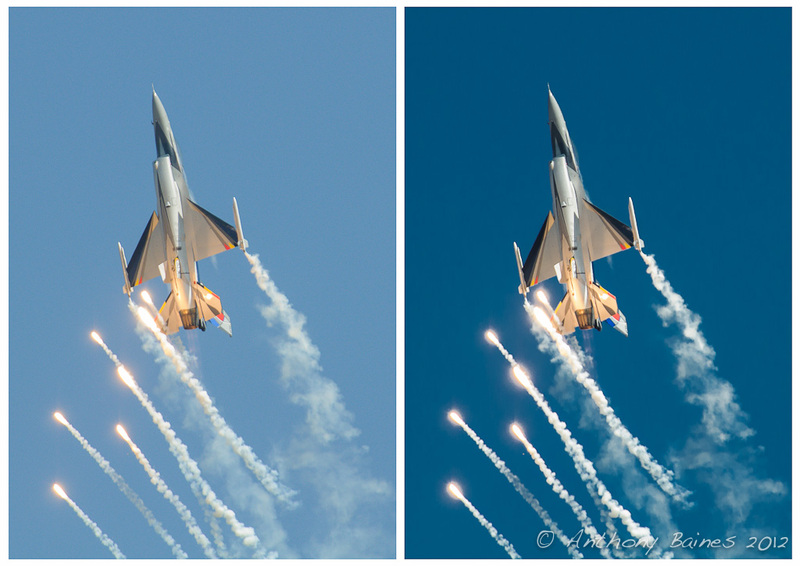 The best way to do this is to use the targeted adjustment tool for Luminance and then drag downwards on the sky. What usually happens when doing this, though, is that the apparent saturation of the sky increases to the point where it is not realistic. So now use the targeted adjustment tool to drag the Saturation on the sky down (maybe just a little) to the point where you get a fairly realistic looking intense sky. At this point, all the manipulation to the sky can bring out a lot of noise. So it is necessary to add a bit of noise reduction from the Detail panel. It may be necessary to use both Luminance and Colour noise reduction. For simplicity, I've set up a Lightroom preset that drops Blue and Aqua Luminance and Saturation and adds some noise reduction. This makes a good starting point for intensified skies, and typically does not require big moves on the sliders from there to get a satisfactory result. Fig. 2 shows the HSL settings for this. This works well so long as the subject aircraft is not bright blue itself -- and most that I come across are not. Even where an aircraft has, say, a blue stripe on it, the effect is not objectionable, and so generally does not require masking off. Monkey orchid flower head: D300/ 90mm Tamron f/2.8. Focus stacked with Helicon Focus. As a follow-up to Martin's last post on photographing wild orchids, here are a couple of mine from this week. The evening when Martin and I went to see the orchids was very still, so it looked like a good time to photograph them: even though the light was quite dim, the orchids were not moving in any wind, so slow exposures were possible. 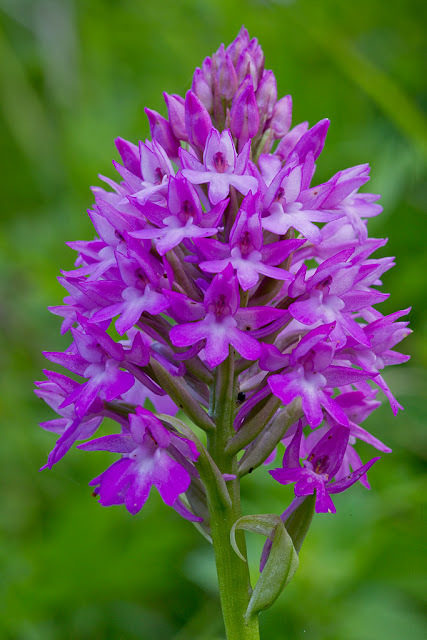 The sky was also quite bright, which gave the opportunity to open up the shadows in the orchid flowers by using a small reflector positioned at the base of the orchid plant. I wanted to be able to get some close-up pictures of the flowers where the background was suppressed by being defocussed. The problem with this is that the orchids were in quite dense foliage, so to get an out of focus background means using quite a wide aperture. Correspondingly, there is then the problem of depth of field across the flower. As I have blogged previously, one solution to this problem is to use focus stacking. In this, a series of images is taken by changing the focus point through the subject, and then the images are combined in software (I use Helicon Focus) to produce a sharply focused image across the depth of the subject. The background is still so far out of the plane of focus that stacking does not change its smoothness. 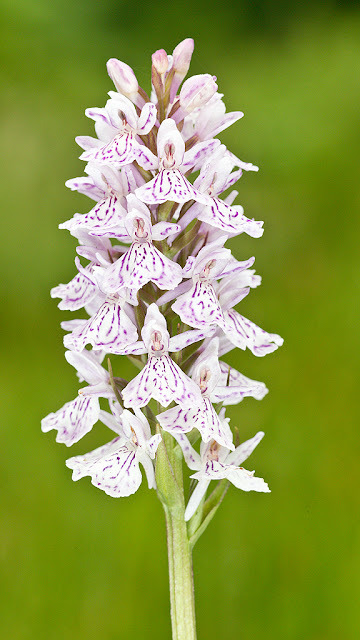 We met Martin's friend Steve at the site, who was also out photographing the orchids. He is another Nikon user, and he offered to lend me his Tamron 90 mm f/2.8 macro lens to use on my D300. The picture at the opening of this blog post (upper picture) is a stack from one of the resulting series of images with his lens (thanks, Steve!). The images were all taken at f/5.6, which I chose to give a sufficiently smooth background, but with enough depth of field within the flower so that the individual planes of focus did not have to be impossibly close to each other. I set the camera onto manual control (aperture, shutter speed and focus), and then used the smallest possible movements of the focusing ring between shots to move the plane of focus across the subject. Back home, I simply exported 16-bit ProPhoto RGB Tiffs from Lightroom, and popped them into Helicon. 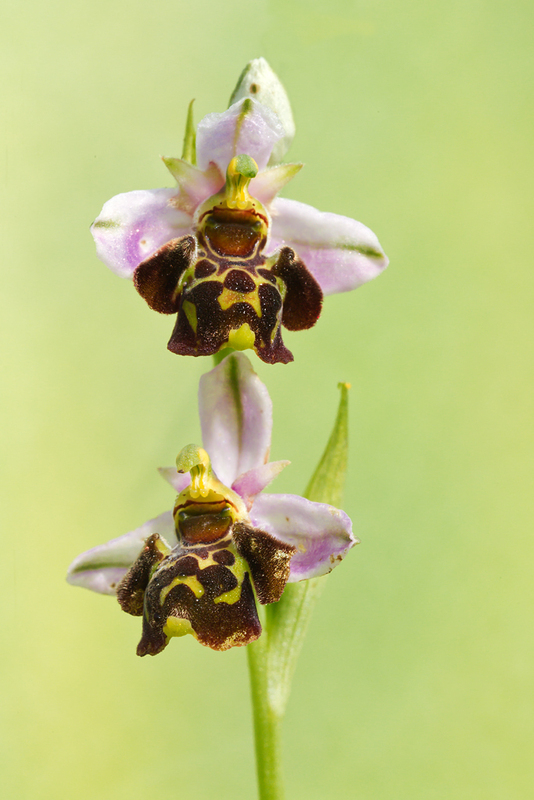 As a first go at focus stacking orchids in the wild, I think it is not too shabby, and the Tamron lens seemed to live up to its very high reputation. I had taken my own 60 mm micro-Nikkor: although that is a great studio-type lens for flowers, on this occasion I really feel that the extra focal length of the 90 mm was very helpful. It would also have been nice to be able to control the camera using automation to ensure even and small steps. Helicon Remote does this very well, but you need to run it from a laptop, and I have enough to carry without schlepping a laptop on countryside shoots! I see on their forums that Helicon are finding it difficult to adapt Helicon Remote to the iPad: I hope this can be sorted because I think that controlling focus stacking from an iPad in the field would be a very powerful approach. I went back with Gina a couple of days later. She was also keen to see the orchids, and was an uncomplaining assistant with another shot. The evening we went back it was too breezy for focus stacking -- the orchids were waving around far too much. But the overall light was nicer, so I tried some pictures to show the orchids in their landscape setting (lower image, above). My idea was to try to show the orchids (really quite small flowers) and the slope of the valley they are growing in. As I've mentioned previously, I have a predilection for using an ultrawide lens; I thought that by getting down to the level of the flowers, and as close to them as possible, with the Sigma 10-20mm lens set at 10 mm on the D300, it should be possible to show them in their context. 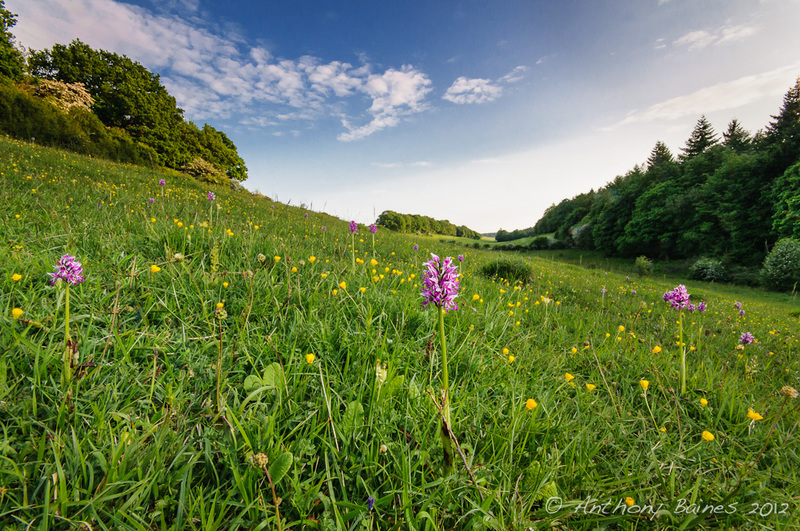 Several difficulties came up with this, not the least being that while the lens needed to be set on very close focus for the orchids, but I also wanted to show the extent of the valley. The simplest way to get the required depth of field was to use f/22. If you read the forums, you will be told in no uncertain terms never to stop down this far because diffraction effects will ruin the picture. And there is no question that this setting does nothing for the ultimate sharpness of the image. In general terms, it might have been possible to use focus stacking to achieve the extreme depth of field I wanted, but with the flowers waving in the wind I didn't fancy effects of ghosting. The other problem was with the range of brightness between the side of the valley where the flowers were and the sky that I wanted to include. The brightness range was in excess of four stops. So to get everything on scale with a correct exposure overall in a single image, I put a three stop graduated neutral density filter over the sky (which also impinges on the tree line), and then lit the foreground by firing in a flash through a large diffuser. 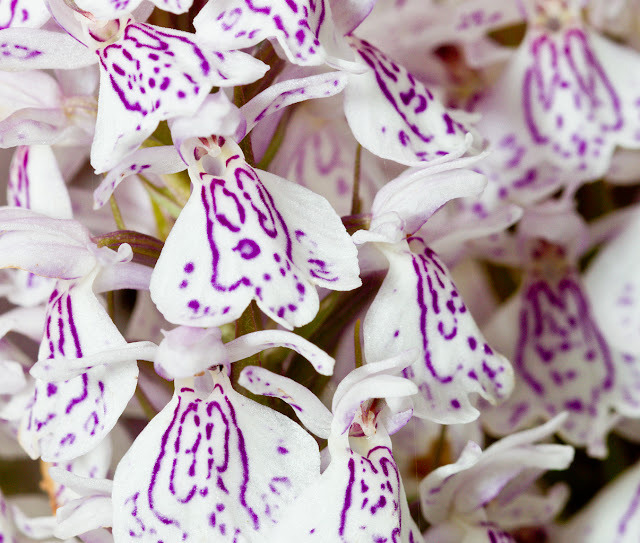 The flash helped give the orchid colours a bit of pop. I am reasonably happy with the resulting image: it required minimal post processing, and just for tidying up. I suppose I could have HDR’d it, or blended several exposures by hand in Photoshop, but I’d actually prefer not to. Thinking about it, I think these two pictures illustrate the way I prefer to work. I’ll assemble a picture in post-processing when I need to (there’s no better way to get the first picture than by focus stacking), but I enjoy the challenge of getting a picture in a single raw file if I possibly can, even if it means using a combination of ultrawide lens, tripod, remote release, flash and wireless trigger, diffuser and ND grad. Nothing’s simple! Lots of fun, and thanks to Martin for getting us there in the first place.